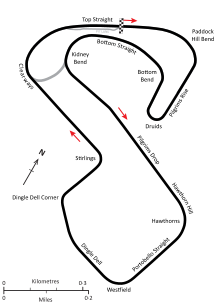 The 1974 Race of Champions was a non-championship Formula One race held at Brands Hatch on 17 March 1974. The 40-lap race featured both Formula One and Formula 5000 cars, and was won by Belgian driver Jacky Ickx in a Lotus-Cosworth, with Austria's Niki Lauda second in a Ferrari and Brazil's Emerson Fittipaldi third in a McLaren-Cosworth. ^ "The Race of Champions: Wet and interesting". Motor Sport. April 1974. p. 31. Retrieved 20 October 2017.